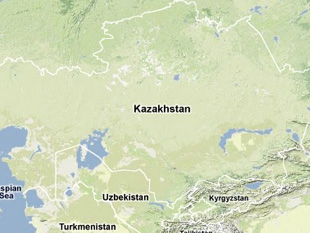 As of 2013, Kazakhstan leases Taysoygan's facilities and combat training grounds to Russia. Ivan Safronov, "Kazakhstan Does Not Want to Be on Friendly Terms with the Test Ranges: It Wants to Sell Them," Kommersant, 15 June 2000, p. 2; "Kazakhs Weary of Russian Military Leases," FBIS Document CEP20000615000322. Musa Satayev, "Rossiya khochet ispytat Kazakhstan . . . raketami," Ekspress K, 30 May 2000; Eurasia, www.eurasia.org.ru. Kanat Shaymerdenov, "Nesmotrya na to, chto deputaty ne ratifitsirovali soglasheniya ob arende Rossiyey poligonov, oni vskore dolzhny blagopoluchno proyti cherez mazhilis," Panorama online edition, www.panorama.kz, No. 24 (390), 16 June 2000. "Kazakhstan Ratifies Agreements on Russia's Use of Testing Ranges," Monitor--A Daily Briefing on the Post-Soviet States, Vol. VI, Issue 130, 5 July 2000; Jamestown Foundation, www.jamestown.org. Юрий Гаврилов [Yurii Gavrilov], “Минобороны модернизирует 11 военных аэродромов” [“Ministry of Defense is Modernizing 11 Military Airports”], Российская газета [Russian Newspaper], 7 May 2013, www.rg.ru.